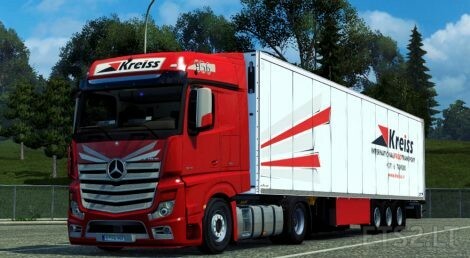 Mod include: Volvo FH with reworked mirrors,skin for Mercedes-Benz 2014,trailer Schmitz. Authors: Andis Kreps,Andrey Davydenko,SCS Software,Джо,Kamaz, Ventures, Bora, 50keda,DANZ aka d3s,Jekich1,Knox_xss,AlexeyP, davidzoli, Flemming V and Capital, I am sorry if i forgot someone. проблема с прицепом ! Его нет в грузах , проблему можно решить? Volvo FH flies, which goes to the pack. Solve the problem!